What would you do if everything – and everyone – you loved was taken from you? Rand Sebastian, ex-Navy SEAL and now a full-time family man, is about to discover that evil lurks in the world. Real evil. And when this darkness comes after him and his family, he will do everything he can to stop it…and to save his loved ones. Now trained by the legendary Brotherhood of the Blade in a remote castle setting, Rand will learn all the skills necessary to find his missing daughter…and to stop the killers who prey on mankind. 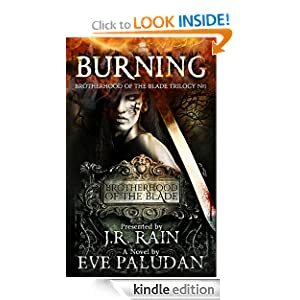 Burning is a full-length novel and the first of a trilogy. The next two books in the series will be available throughout 2013.